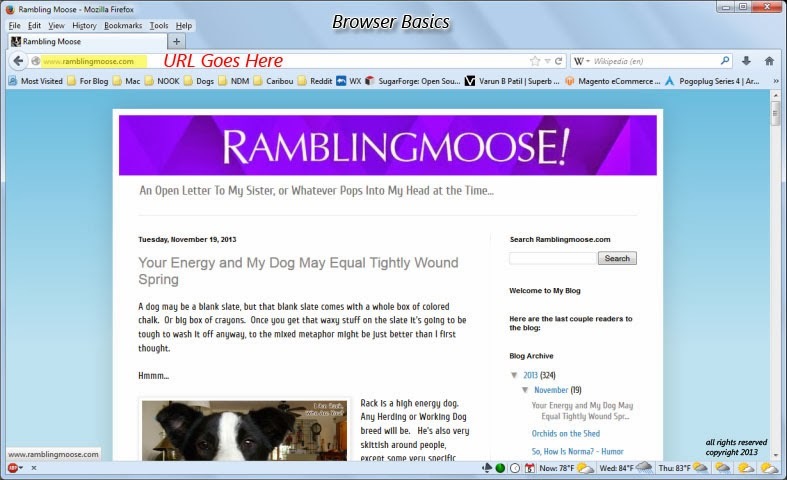 Rambling Moose: Browser Basics - Where Do I Type The Web Page? Some of you will look at this discussion and wonder why someone would do what I'm going to describe. I was looking at the statistics for this blog and thought I'd lend a helping hand. Most browsers, when you start them, will put you at a search page. Typically that is Google for Firefox and Chrome. I think Safari drops you onto www.apple.com on the Mac. I try hard to forget anything connected with Internet Explorer these days. So you get a big helpful page with a box to type in your search query. You typed in Ramblingmoose. Hit enter. It gives you a list of articles I wrote. 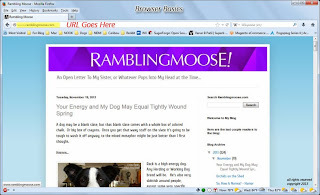 It should have the base web page at the top - http://www.ramblingmoose.com . You used your mouse/trackpad/trackball to move the cursor to the link and clicked on it. If you did all that before I put this article up on the web page, you would see the picture, minus my writing and the little yellow box. We all start somewhere, and if you aren't told how to do something basic, you will figure it out the best you can, and repeat it until someone whispers in your ear an easier way. The little yellow box is where you should be typing that address, unless you really did mean to do a search. It is called the Address Bar, generically, although I've heard other "Marketing Friendly" terms used. In Firefox, at least, if you type in the majority of the name, it will try to "make" the most likely URL for you. URL is the web address like www.ramblingmoose.com or some other website. Why is that important enough to warrant a blog posting? About 10 percent of you do a search each day to get here. That's why you came here. Now I'll go back to finding Just The Right Font for this blog and annoy everyone with changes every couple minutes until I'm satisfied. I just don't like Arial or Helvetica. Bleah.